Hetzner has stepped up its game in the cloud VPS hosting market with a brand new, powerful and yet cheap cloud VPS instance called CX11 at a mere price of 2.49 € per month (without VAT - VAT varies per country so real price will be slightly higher depending on the VAT rate for your country). This is a call for competition in the market of Do, Vultr and Linode. More than that. Hetzner offers so much more than all of them for small money. Benchmarks were taken from: https://lowendtalk.com/discussion/136168...ud-hosting (because I don't have my service yet but I'm planning to replace my Vultr server with a CX11 instance). A good example of price for German citizens: 2.69 € per month (19% VAT) . Very good specifications and the price is really fair. People from countries with lower VAT benefit even more. Thanks for the recommendation @HR. I've been eyeing Hetzner for a long time, however was confused as to which of the VPSs would be a good one to go for. 3 US$ a month sounds like a good deal though. Only worry I have is whether Hetzner has changed its antiquated accounting system where one needs to make arrangements for a bank debit order - thereby effectively excluding a large number of people outside Germany. I tried to subscribe for a shared hosting account a couple or more years ago and was unable to do so. Guess now's the time to check whether they've caught up with PayPal or credit cards yet. Oops! I'm a little confused here. Is it a dedicated server or a VPS? It is what many call a "cloud VPS" or just simply a VPS. Like DigitalOcean and Vultr, Hetzner also uses KVM for virtualization of their cloud VPSs. I never even used the word "dedicated" and/or "dedicated server" in the OP. Oh and this is just sharing of a good deal. Not a recommendation. I can hardly recommend it when I don't have service with Hetzner or haven't tried the product. I will look at payment methods and see if I switch from Vultr to Hetzner. OK got it although it hit a note of recommendation with me of course as I really like Hetzner. We are on a very large linux cloud VPS at Frihost so I can fully recommend Hetzner. We've had unbelievable uninterrupted uptime from January 2015. I did check the CX11. It does have a PayPal payment option and the whole spectrum of credit cards and I'm sure debit cards too. Only part I didn't like was that it asks for a passport or ID copy. It gives an assurance in the request e-mail that the copies will get deleted once seen, but doesn't really make me feel any better. I've never been asked for that before so not sure I'll be subscribing for that reason - for now anyway. I still think having an account with Hetzner is more appropriate for those living in Germany or in border countries in Europe who are more used to restrictions of this kind and of which the banking institutions are more integrated. For those outside it is doable but not as spontaneous, familiar and easy as we're used to. Well, Hetzner is a real and big company that is well known and recognized in the hosting industry. They have their ways of fighting fraud and scam. One part is to generally request a copy of your passwort or ID to verify you are who you say you are. I guess you can take it for granted with Hetzner that this is necessary only once as they said. Hetzner isn't just a one man show and neither one of the lowend providers. They are not just a simply hosting provider after all. They are data center operators offering various kinds of hosting services out of their facilities. Anyway, it is great to hear they support PayPal. PayPal would be what I would prefer to top up cloud credits. One reason why I never planned to buy any service from Online.net/Scaleways or OVH... They stopped supporting PayPal for payments. I'm not going to get a credit card. I just spun one of their 2GB instances up and it’s been great. The I/O seems a bit slow for NVMe, but the CPU and network are decent. For anyone who wants to sign up: the ID verification took a few days (this was before the cloud launch). Yesterday I registered an account on the Hetzner Cloud site. The second mail I got was about account verification. I scanned my drivers license and replied to the mail with the scanned drivers license. A few hours later my account was verified, a default project was created as opposed to having no project in unverified state. And I created my 2 GB instance. All went well. Selected PayPal at the payment page on the last page of registration and that went well, too. Their notice says bills have to paid manually through a button in the panel that appears when bills are generated. So doesn't look like they use PayPal Subs for automated payments like Vultr does. Maybe better but a bit bothersome. The pricing at Hetzner Cloud compared to the other cloud computering providers is quite cheap. 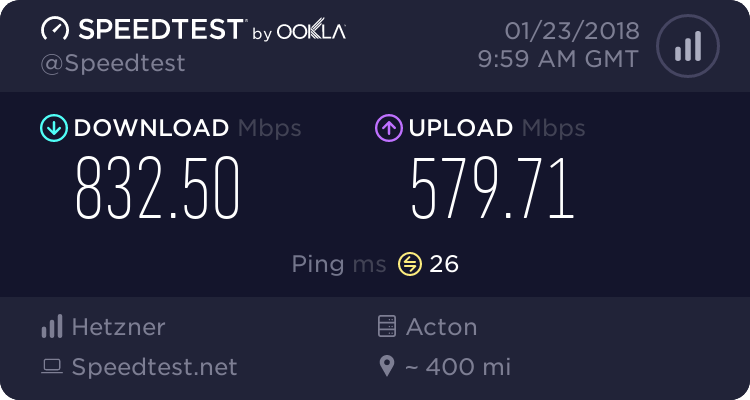 I haven't gotten a chance to test it yet when they released it, but I tried their beta service and the performance was really good. They should put in a few smaller packages for people who don't need all of the resources in the current smallest one they have. Heads up! Hetzner has added their Finland location for their cloud service. The specifications and prices are the same but the service will be located in their new Finland data center. Thank you @monad, For sharing this generous offer. Was being ddosed at my previous VPS. Have switched to heztner, Helped me alot. Their VPS creating system is very great. Current time: 2019-04-24, 8:58:24 pm Powered By MyBB, © 2002-2019 MyBB Group.